Our IMPACT Toolkit™ provides practitioners and managers with the knowledge, tools, techniques and templates to make sustainable improvements in the workplace. Find out about specific Lean and Reliability training, dates and locations or contact us for more information on bespoke training. The IMPACT Toolkit™ for Lean provides proven, best practice yet practical tools, techniques and templates to eliminate non-value adding activity from your organisation. Understanding how Lean affects Quality, Costs and Delivery, industry benchmark key performance indicators and how eliminating the 7 wastes from the process improves productivity, quality, flexibility and customer service. 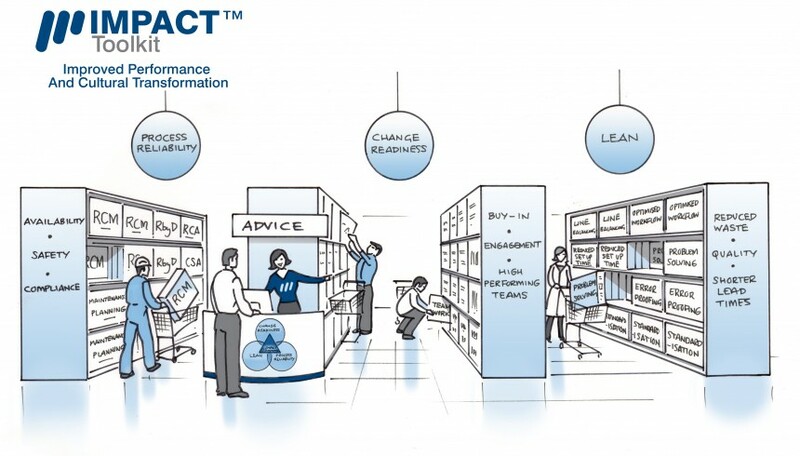 The IMPACT Toolkit™ for change purpose is to implement changes to operational practice by paying particular attention to the level of performance of the working teams. It should not be assumed that teamwork comes naturally so allowing people to have team effectiveness training enables them to continually review and develop teamwork and performance. We provide bespoke, on-site, IMPACT Toolkit™ training workshops for a minimum of 5 people completely tailored to the needs of your organisation. Talk to us about your requirements and we can advise you on the best combination of Lean and reliability tools and techniques required to deliver results for you in your unique operating environment.